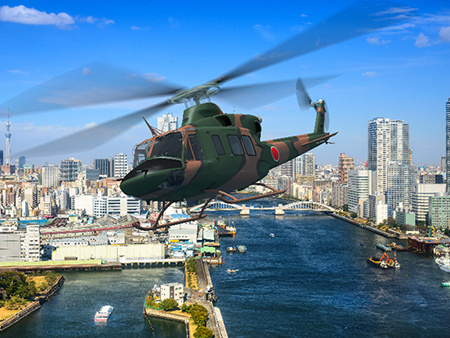 Tokyo, September 2, 2015 – Fuji Heavy Industries Ltd. (FHI) today concluded a contract with the Ministry of Defense for the initial project of developing a prototype of the next-generation utility helicopter (UH-X) for the Japan Ground Self-Defense Force (JGSDF). FHI will co-develop with Bell Helicopter Textron Inc.*1 an advanced variant of the 412EPI, the latest model of the Bell 412 series with proven reliability and versatility which is used in search and rescue missions. Tentatively named the Fuji-Bell 412+, the co-developed helicopter will constitute a platform for the UH-X for the JGSDF. FHI plans to make maximum use of its original technologies, including metal surface treatment technologies as well as highly efficient production technologies built up in the course of mass-producing civilian aircraft. Under a strong 55-year partnership with Bell Helicopter Textron, FHI will build a production line and maintenance facilities for the UH-X and the Fuji-Bell 412+ at its Aerospace Company*2 in Japan and the two companies will work together to promote the helicopter business.